Holiday traditions around our place include Persian food which is bursting with flavor and can be a great option for a variety of functions, from feeding a large number of people to being a delicious meal for just your family. Every year we make lamb shanks at Christmas time. It’s one of my favorites and it’s so easy! 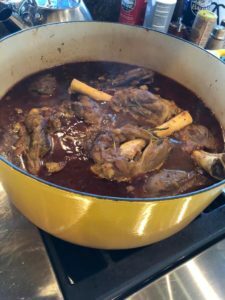 Lamb shanks are nicely paired with basmati rice (recipe also listed below), a salad, some sautéed brussel sprouts or green beans and fresh bread. It makes an elegant and delicious meal, perfect for the holiday season. Add crushed tomatoes, chicken broth, rosemary and thyme. Bonus: Lamb shanks can easily be prepared ahead of time and then reheat and to serve when needed. This rice is frequently found on our dinner table as it is a staple of the Persian diet. Friends and family LOVE it and always ask for it when they come over … and it’s so easy! Place 4 cups water in a saucepan over medium-high heat; bring to a boil. Add rice; cook for 10 minutes. Drain. Rinse with cold water; drain. Combine yogurt, salt, and saffron in a medium bowl. Add rice to yogurt mixture, stirring well. Melt butter in a medium nonstick sauté pan over medium heat. Add oil; swirl to coat. Add rice mixture to pan, lightly packing rice down. Wrap a clean, dry dish towel around lid to pan, tying it at the handle; place prepared lid on pan. Cook rice, covered, over medium heat 20 minutes (do not stir or uncover). Reduce temperature to medium-low; cook an additional 20 minutes or until rice is tender on top and a golden crust forms on bottom. 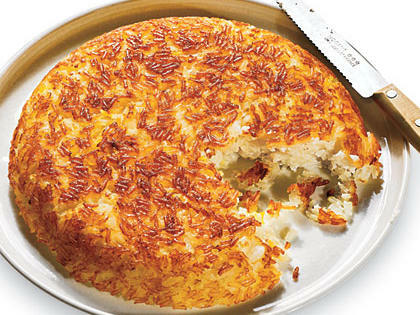 Loosen the rice crust with a rubber spatula around the edges. Place a plate over the top of pan, and invert the rice onto plate, browned side up. Cut into 6 wedges, and serve immediately. Rice Cooker Option: you can also use a rice cooker and achieve the same thing – basically put all ingredients into the rice cooker, close the lid, press start and voilà, done! All you need to do is let it cook. Again, with this option I like to remove the cooking ‘basin’ from inside the rice-cooker and place it upside down on a serving platter so that the rice falls out, with the golden-brown finish on top, which looks beautiful and adds an extra layer of texture to the dish. What are your traditional holiday meals? I’d love to hear from you and read your favorite recipes! If you try making lamb shanks and basmati rice, let me know how it turns out and happy holidays!